Getting on an e-bike can often yield very similar health benefits to undertaking a specific training program. A combination of cycling for ½ hr per day and a calorie controlled diet can achieve weight loss comparable to that achieved by doing three aerobic classes a week. As well as being positive in regards to physical health, cycling is also proven to positively impact emotional health as well – improving levels of well-being, self-confidence, and tolerance to stress while reducing tiredness, difficulties with sleep and a range of medical symptoms. With an electric bike, you can put in as much, or as little, effort as you feel comfortable with. The more you do, the less the bike does and vice versa. Imagine the benefits when you reach the bottom of that daunting hill on your way to work, just turn up the power and you can cruise your way up to the top. Even better, because you will not have to make a big effort, you will not arrive at work all hot, sweaty and bothered. Just look at how much effort the Chinese have put into the development of these e-bikes! It really seems like China is the new Go-Green Model. 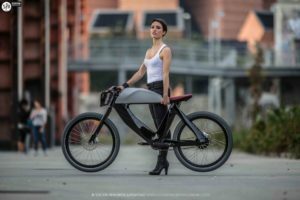 Because e-bikes are such high-utility, low-impact methods of transportation, they are being utilized more and more by people to take short trips which would formerly have been completed in a car. Replacing the high impact of a single passenger car with the low impact of an e-bike will make a positive difference for both the individual and environment. Riding an electric bike is good for the environment in a surprising number of ways. As well as offering no pollution, they also make no noise. Using an electric bike also often means that there is one less car on the road, meaning less traffic and less pollution. Whilst electric bikes obviously consume a small amount of energy, that consumption is still significantly less than even the greenest car or motorbike – the only CO2 emitted when the bike is in use will be from the cyclist’s lungs and there are no fumes emitted from an exhaust pipe. If you get your power from a green supplier or even generate your own with a wind turbine or solar panels, an electric bike is truly sustainable. In all these great developments, technology education plays a vital role. We must educate future generations to keep up with developing and implementing technological marvels.